It seems to have taken ages to get round to this, but thank you for your patience. You’ve been very kind. Ready to roll? Good. Hopefully you managed to get hold of some pork skin and went through the laborious procedure of putting it on a tray, grinding some salt over it and popping it all in the fridge. It should take all of two minutes. If not, here is a quick recap (homemade pork scratchings part one). Unlike most methods, this one needs no deep fat fryer - just an oven. Turn it on to about 180 degrees C. Remove the tray from the fridge and dry the pork skin. The salt will have helped some of the water leach out – this will give you supremely crackly pork snacks. Grind a little more salt over both sides of the skin and put it all in the oven. Then wait. This is cooking so easy that it should come with a pair of slippers, a velvet robe and large armchair for relaxing in. After ten minutes or so turn the oven down to about 140. You are doing two things here: One, rendering out the fat and two, drying out the pork skin nice and slowly to get that beautiful flavour and texture. Roughly every twenty minutes, you’ll need to drain off the fat (of which there will be much. Keep it. Seriously. Pig fat has a multitude of uses, all of them tasty. You could make rillettes?). Take this opportunity to turn them as well. They should take about ninety minutes in total. This is quite an instinctive recipe – you just know when they are ready. The colour will be deep and rich, they will have curled up into neat little shapes and the skin will be starting to bubble. Leave them to cool. Season with black pepper (and more salt, if you wish) and then eat them with many bottles of cold beer. Depending on their size, two or three should be enough for each person. This is one of those snacks that you take one bite of and say ‘I could eat those until they come out of my finger nails’ but by the third mouthful you are ready to throw in the towel and have a nap. 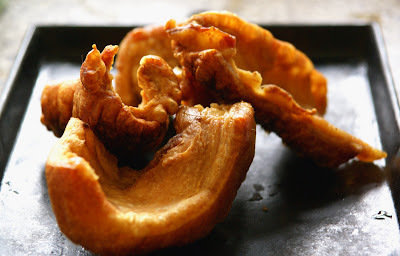 The perfect pork scratching has a reverse side so crispy that you fear for your teeth and an inside with a little fat and meat left on so you get a textural contrast of such deliciousness that you are almost guaranteed to make that noise. Go on, be shameless. You know you want to. At first I didn't realize that you guys call it pork scratchings. Cute name. We call them pork rinds and generally they are deep fried. But I like the simplicity of this recipe and it's the "low fat" alternative. These may be in my future. I'm ordering pork belly from the butcher to make bacon and pancetta. I'll use the skin to make pork scratchings! ohmyohmyohmyohmy. you've stolen my heart, and clogged it at the same time. lovely. High Calorie and HIGHLY worth it! Great photos. 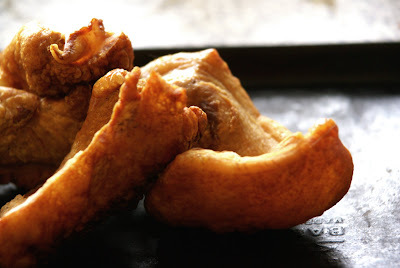 We've always called these "cracklings" (pronounced without the g of course--cracklins) and they are delish! OMG...I love pork rinds, I have never eaten homemade before, but they do look great. Fantastic blog - and you've been going for ages! I wonder how I never came across you before. I love the scratchings experiment. Funnily enough I was talking about making them just last night. I am very pelased to see your method doesn't need a deep fat fryer because I have a huge fear of large quantities of hot oil and I can never bring myself to do it! Pork scratchings are so rich they feel almost slightly suicidal. I doubt many heart specialists would entertain them. That said, the skin of a pig, cooked, with a good shake of salt is culinary alchemy at it's absolute best. You have to send this to the boys at Hairy Bar Snacks. World in a PAN - Granted, it is high calorie. BUT, they aren't deep fried, much of the fat is rendered out, it is all natural and they are only eaten rarely in small quantities. It does you good every now and then! eatdrinknbmerry - Thank you for the kind words. Consider me blushing. MyLastBite - Thank you very much. 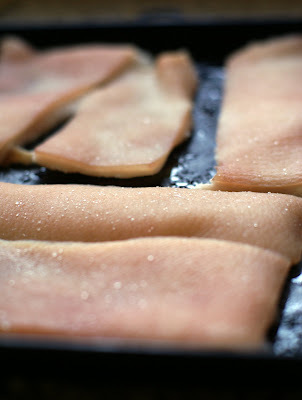 I thought it was going to be very tricky to take pics of dried pig skin but apparently not! Rhonda - yeah, same stuff. Pork scratchings is a very English name. Reminds me of pubs and ale. Plus they can be a little scratchy on the throat. Thanks MaryBeth, you should give them a go, very easy. Helen - Thanks for stopping by. Glad you like it. Indeed, I've been tapping away about food for quite some time. I know what you mean about big pans of boiling oil. This is much less risky, and a little less calorific. them apples - Agreed on all counts. Culinary alchemy is the perfect way to describe these. Pig snacks- very nice, i might have to pop up the road to the butcher and grill franchise to get some, they give all their offal and bones away free (a chef i worked with told me they make their stock from maggi...) Got some pigs tails a while back and did them St.John style, I think this post has promted me to post it! As always good stuff. I love that you didn't fry it, yum! We call those hog cracklins or just plain cracklin and your are right, they are just soooo delicious. Sometimes I make them the Cajun way by reducing in water then letting them render themselves a big iron pot. One of my fav snacks. Thanks NIck - it's amazing what you can wangle for nothing if you ask nicely. What people forget is that it costs butchers money to have bones and the like taken away so you are actually doing them a favour by taking it off their hands. gaga - It really makes a difference to calorie count but little difference to the flavour. wow! I think you're a great chef and a fabulous writer! I haven't had pork scratching before. So I'd like to try it. Mine are in the oven now - they are taking a lot longer than 90 minutes! 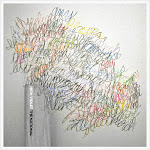 ... 4 hours! FOUR HOURS! OMFG you are a legend. I have been trying to get pork scratchings (the type they sell in the UK) for AGES. In Australia, you can't import them (customs doesnt allow them believe me I've tried) and no one makes the sort you get in the UK.. all i'm stuck with are the kinds you get at an asian grocery store and they are not very salty or fatty and are called pork rinds. Did these this afternoon, for the first time, using some skin from a shank I used to make cassoulet the other day. 40 minutes total cooking time until they were golden and crispy and my family were munching them like crazy - with hardly any fat drain off. I presume different parts of the pig's skin have different amounts of fat and will therefore take less time to cook. Thanks for a useful addition to the repertoire. Thanks for such an entertaining recipe. I've just started to experiment with cooking pork scratchings, as you just can't get them here in Dublin. I'm curious about the refridgeration part of this recipe? What purpose does it serve? I will be trying this because I am in Romania and they LOVE pork here but have never heard of pork scratchings. Having been in the UK for years I love'm. Also its a great snack when you are on Atkins diet. yes!!!! mine are in the oven after a long long search for some pig skin at the supermarket! yes it's true that it's easy to over indulge on this but oh the smell, the taste, the heart attack!! !